99 pairs produced per year. 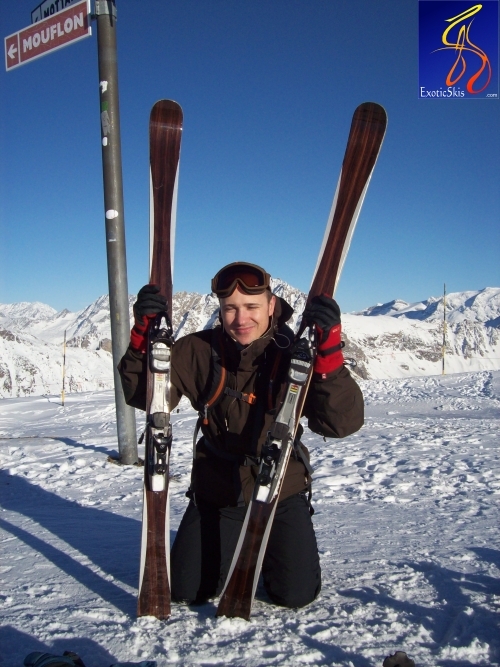 8 - Heavy experts / people looking for race-ski experience > 90kg or "muscle skiers"
Ideal for frontside resort skiers in the luxury market. Right on target. Superb all-terrain, low-effort luxury carver for non-racer types. (with emphasis on packed or less-than-knee deep conditions). Expensive, but a beautiful work of art that skis superbly. Ash laminated Wood core, fiberglass sandwich with titanal inserts on outer edges of palisandros wood topsheet for protection. Laser-etched name badge. 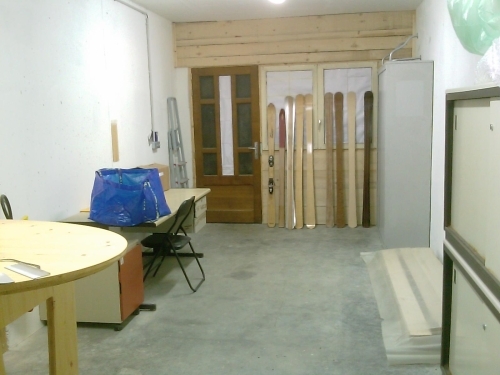 Triaxial fiberglass 900 gr/m2. Extremely lightweight per pair. Thin vertical profile with smooth, even flex pattern responding with lively rebound and nice vibration dampening. 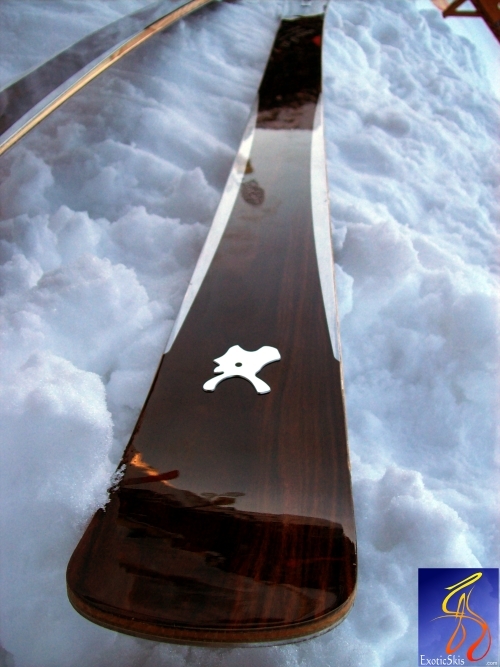 Gorgeously finished, hand-made artisinal ski. This is one of those "put on your white gloves before handling" type of artisinal skis. I hated to get fingerprints on them. 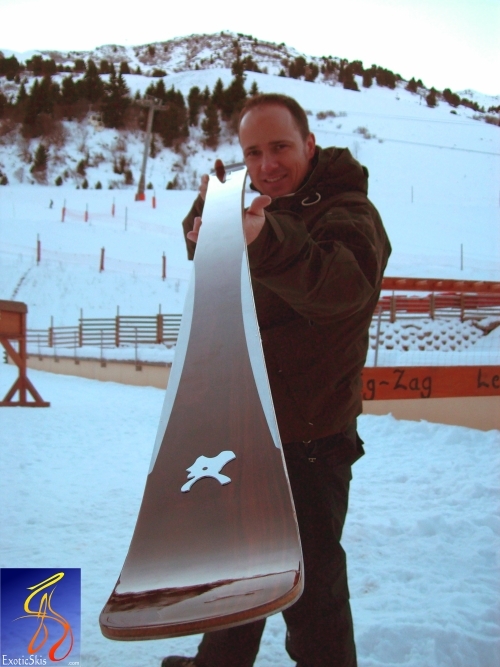 Non-radical, fairly typical carving ski geometry. "Elegant" was the lasting impression I got after seeing them for the first time. Cold, dry, packed manmade base conditions with some fresh snow several days old groomed into the surface. Meribel-Mottaret, France. December 2008. I immediately felt at home on the Styibwe skis during my first 10 turns. Very easy turn intiation with smooth, quiet manners producing elegantly round turns under any degree of pressure or edge angles. The Styibwe maintains a quiet, refined ride, even when pushed into GS-like turns at more-than-moderate speeds. Never nervous, never twitchy, but remarkably responsive, nimble and capable of very quick turns and response due to their very light weight while maintaining the ability to create silky turn shapes with a dampness devoid of any "dead" feel. Very, very nice. 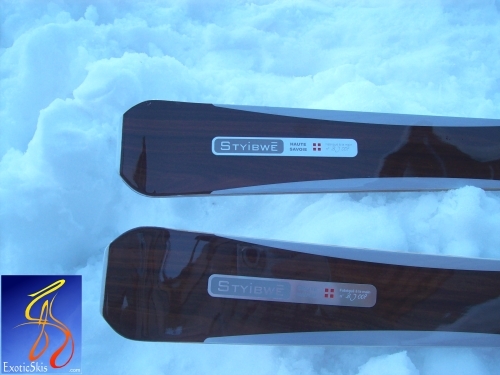 The Styibwe (it means "ski of wood" in the old language of the Savoie region) has an excellent feedback and feel underfoot - perfect for its intended market of frontside resort skiers who appreciate elegant things. 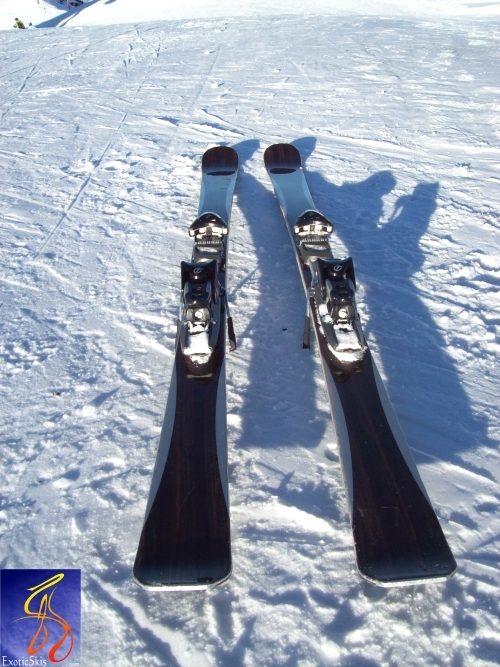 While the ride and manners are refined, these skis are definitely precision carving tools with high performance capable of grip, release or drift when desired at a variety of speeds and angles. 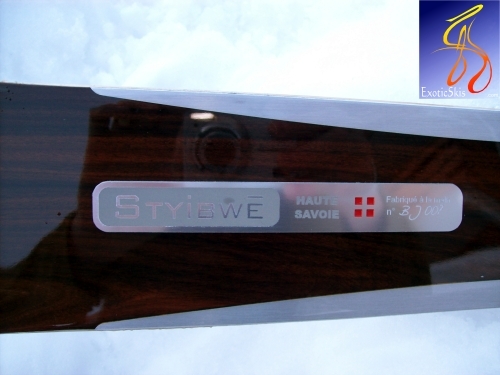 The Styibwe is not a "race carver", but a high-performance carver requiring much less effort and concentration to enter, hold or change a line on the terrain than a race-oriented ski or detuned race ski. If you pressure it too hard on a bulletproof, hard surface, the ski will yield some grip in a predictable manner with plenty of warning and feedback - unlike some luxury skis whose mannerisms become abruptly rude or scary when pressed beyond their performance envelope. 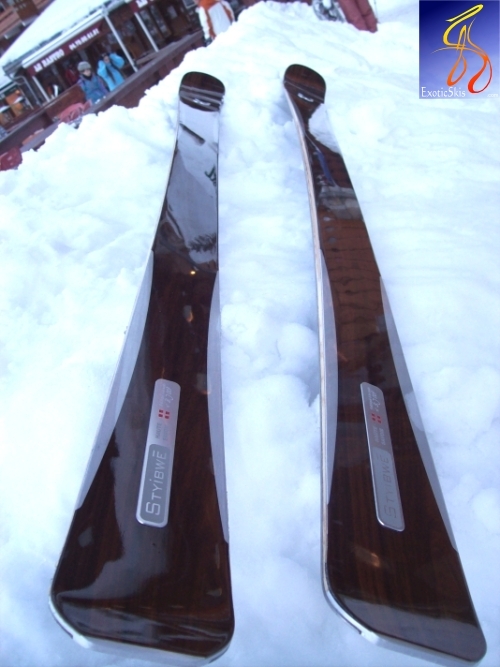 If you want race-like performance and demanding input in a beautiful, hand-made package, there are other skis in this price range you might like better. If you want a smooth ski to make great turns without effort and don't need race-level behavior and the degree of input it requires, this might be your ski. I immediately thought I could put nearly anyone on this ski and they would come back grinning. The ability to smear a turn lazily or execute high-angle edging gymnastics with surgical precision was refreshing and fun. 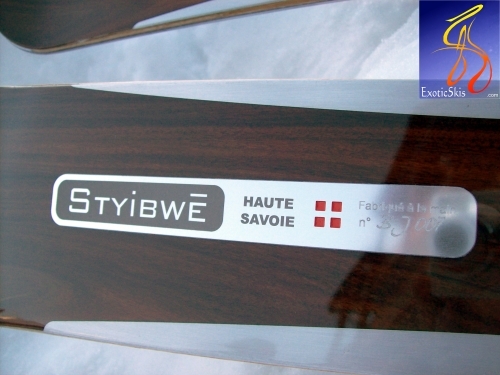 The Styibwe is not a boring ski by any means. Some luxury skis want to give you a smooth, all-mountain ride, but sacrifice the zing and fun of high levels of performance. Styibwe's ski delivers an elegant ride with plenty of lickety-split zing and pop when asked, without demanding extreme athletic input from the driver. Jerome Nadal has created a definite collector's item I think. I thoroughly enjoyed this ski. It's expensive, but it's handmade and lovingly finished like fine cabinetry or furniture. Skip buying yourself that expensive watch, you'll have more fun with these. Their performance is not revolutionary or radically different from many other fine skis, but to package their performance in a remarkably beautiful finish is a rarity some people won't mind paying for. An Audi A4 with really sporty tires mounted on lightweight rims: nimble, smooth, grippy and comfortable for all day driving, but sporty enough to yield G-forces to make you grin. High quality. 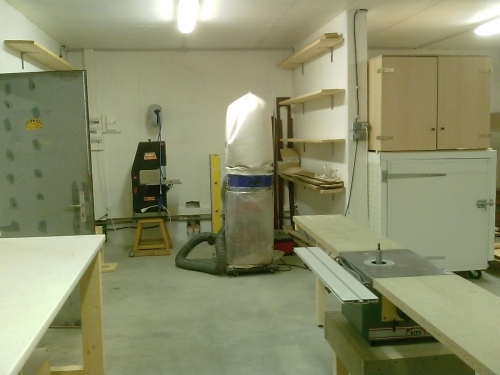 Another shot of the new Styibwe workshop.